I am talking about the coasters I made this morning. One of my blogger buddies, who I read every post of - but I can't remember which- posted a link to this tutorial. These are simple to make and easy to sew because sewing is a very minor part of it. I will warn you that layering the fabrics prior to sewing is important. You have to put the layers in the right order and layer NEATLY or you will be fussing when they don't work out. You see, I was making a set of four -just like in the picture, but OOPS - I messed up. First I didn't layer one set neatly and missed an edge. Easy enough to fix, right? Wrong, when I turned it back to re-sew, I didn't get the layers back in order. Cut a few more squares and try again. Well fiddlesticks! I put the lining and the base together wrong. So when I turned it...the interfacing was on the outside! ARRRGH. Third time was the charm - and I was EXTREMELY careful. Ha ha. So, I sewed six but got four. Hey there is a learning curve to everything. Granny said, "Haste makes waste" and sure enough it did. I am planning to make some sets of these for the Christmas sale at church. They are easy but they look very nice. B. Speak up and get the credit due to you. C. We love you for sharing. I've made these unique coasters, and you are right, Gene, they are not easy to just whip up until you learn where to be careful. They are so much fun to make and to have handy when needed under a glass. Cute coasters too. They will be a hit - like Little Egypt! Very nice, and great fabrics for a Christmas sale at Church. They should sell very well.....now that you're an expert with making them, you need to make a bunch for the sale! 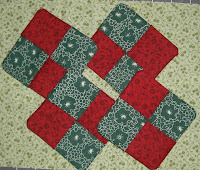 I made many of these awhile ago....and I am quite sure I blogged about them and included the link. But a lot of people know about this, so maybe you got it from another blogger, too. You did a good job...sorry you had the "hasty" errors...although I admit I laughed when I read that part of your post!!! Very pretty fabric choices. An excellent Christmas combo! Nice work Gene. I'm of now to attempt my own set or two. The coasters are adorable. I had shown a group of quilters this project at one our Friday Bee's. That was many years ago. Thanks for sharing this. I will be making more tomorrow. BTW, the stem of a wine glass sits inside the four squares of each coaster. The tutorial is from Criss Cross designs.